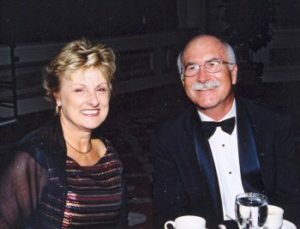 In 2001, my wife Marci was diagnosed with a brain tumor. At that time, I posted a journal on the web to keep family and friends informed of her condition (and mine, too.) While she fully recovered from that ordeal, I left our story on the web for several years so that it could be an encouragement to others. And for the same reason, I have reproduced it below (THE MARCI PAGE). More recently, Marci has been diagnosed with MS and you can read more about that here. On November 30, 2001, we discovered that my wife Marci had a brain tumor. We didn’t know much about it, except that it was big and had been there a long time. This explained many of the mysterious symptoms that she had been experiencing during the past year and a half (see the list of symptoms at the end of this post) so it was a relief to finally find the cause of her problems. But it was also a shock–something we were totally unprepared for. A week later, on Monday, December 10, the surgery (a “bi-frontal craniotomy”) was performed by Dr. Tyrone Hardy at Scripps Memorial Hospital (La Jolla) to remove the tumor. As you can imagine, the days leading up to surgery and the days following were traumatic. We had many friends and family who wanted information on Marci’s condition, but it was difficult to answer all the phone calls and to respond to each one personally. So, for friends and family, I posted a daily journal on the web to keep everyone up-to-date. We appreciate so much the concern and the prayers of everyone on her behalf. To all of you who prayed for her, thank you so much! What an encouragement you have been to us. And thanks also for the well-wishes: the phone calls, the cards, the e-mails you have sent. They have really been a blessing to us all. Our friend Rick Kirby (who knows a lot about medical things) went with us and he also was impressed with Dr. Hardy. 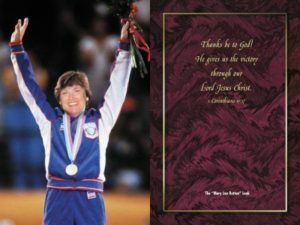 Rick really liked an inscription on the wall that was signed by Dr. Hardy: “I am a Warrior … My will is my sword … My life is evidence of my victories.” It didn’t take us more than about ten seconds to decide what to do. We wanted the surgery and we wanted him to do it. So he started the wheels turning right away and put Marci on some steroids to help prevent the brain from swelling during surgery. He thought we could get the surgery scheduled for Monday or Tuesday at Scripps in La Jolla. They have the best intensive care units, he said, which would be important. I had previously scheduled myself for surgery for some skin cancer on my bald head today, so I decided to go ahead and get it done. It was for a “squamous cell carcinoma” which is a more serious type of skin cancer than “basal cell carcinoma” which I have had in the past. They will have to cut into several layers of skin on my head, put the skin under an microscope and determine in increments whether they got it all. It could take a while, maybe all day. They said I might require plastic surgery on my head to replace the skin. But they got it all on the first pass and I didn’t require plastic surgery. They just tried sewing up the wound which was difficult on my head because my skin is pretty tight up there. I ended up with about two inches of scar. I can cover it up with a hat until it heals. I’ll get the stitches out in two weeks. When I got home around 2 in the afternoon, Marci said that Dr. Hardy’s office had called and surgery was scheduled for Monday. She would be admitted on Sunday. But she needed to go to the hospital today for some pre-op blood tests, etc. So off to Scripps we went. They were expecting us. We spent the rest of the afternoon getting her lab work done and filling out all the forms for admission. She’s to report bright and early Sunday morning. We had one day of “free time” before Marci would be admitted to the hospital, so we drove up to Orange County to see our new grand-daughter Madison Jillayne, who was born Thursday to our son Nathan and his wife Tamara. It was wonderful that Marci got to see her beautiful (and she IS beautiful!!) grand-daughter before her surgery. While I wasn’t thinking negatively, I knew that there was a chance that Marci might not get to see Madison again. The tumor was near the optic nerves and we didn’t know what the outcome of the surgery would be. So it was good for Marci to spend much of today holding her baby grand-daughter. On the way home, we stopped for a nice meal at Mimi’s restaurant in Oceanside. We went to the hospital at 8 a.m. Marci brought her suitcase, reading materials, makeup … like she was going on a vacation. She is surprisingly unfazed by all this. At the front desk, they were ready for us, and escorted us to the 4th floor of the hospital and we were given a room, which seemed nice. Two beds, but no one else there. But I knew that she wouldn’t be coming back here after the surgery because the doctor told us that she would be in intensive care for several days. So, perhaps this room is just for tonight. After we got settled, around 9:30 or so, some doctors came for Marci to take her for an angiogram. She was put on a stretcher and taken downstairs to an operating room near radiology, where a doctor there explained the procedure. Basically, they were going to locate the arteries and veins that provide blood for the part of the brain where the tumor is located. They would then insert devices to stop the blood flow so that she wouldn’t lose too much blood during surgery, and also it would make an easier surgery with less blood. After this procedure, she would be taken to intensive care and spend the night there. I left her there and went back up to the room on the fourth floor to wait. I thought I’d pass the time watching the Chargers game. I sat up there for a while but found it hard to pay much attention to that game–which was just another Chargers loss. I decided to go down and hang out near the intensive care rooms and wait for Marci. Around 2:00, they brought her in and they let me stay with her the rest of the day. She had a few tubes sticking out of her, IV’s and such, monitoring her vital signs. They had her on some kind of medication so she didn’t feel much pain from the angiogram, but she was awake and in good spirits. Later in the afternoon, Amber and Corey came to the hospital and they got to spend some time with their mom. Marci’s sister Dixie also arrived. She drove down from Paso Robles. Intensive care only allows two visitors at a time, so we kind of alternated visits with Marci until about 8 p.m. when we decided to go on home and let her get some rest. All day long I have gazed upon my wife, thinking about the wonderful years we have had together, appreciating her beauty, her smile, her laughter–especially her laughter. What a joy to me and to her family she has been. I am grieving inside, wishing so much I could spare her the pain that she must go through. Several people have commented that my eyes are swollen. I’ve noticed it too, but it doesn’t bother me too much. I just look even more squinty-eyed than I usually do. I’m not sure why they are swollen – whether it’s from my skin cancer surgery or from all the tears I’ve shed the last few days. Surgery was scheduled for 11:30 a.m. But first, they had to take her to radiology for an MRI and and CT Scan. I really don’t know the difference between the two, but apparently they needed both. So, around 9:30, she was taken in a wheelchair to get that done, then brought back around 10:30. During that hour, they allowed us to spend time with her in the ICU, even though it was too early for visitors. Nate came down this morning, as did Amber and Corey. My sister Mary also drove down and Dixie was still here. We’ve had other visitors this morning as well. From church, Dr. Chuck Emert, Walt Barnes, Ray Benton and Ken Elben. They all went in and prayed with us and with Marci. Amber’s friend Carrie Sawyer also spent the day with us. My good friends Chuck Workman and Rick Kirby also came by to offer their encouragement and prayers. At this point, I’m feeling a lot of anxiety, fear, dread … and it was so helpful to me to have my friends there to pray. I found it very hard to pray this morning. The words were just not there. I could only cry and hope that God accepted my tears as a kind of prayer. It is so good to know that so many others are praying for her today. The anesthesiologist came in around 11:00 and explained what he was going to do … they put some more sensors on Marci’s hands and feet. I’m getting real nervous. They came to get Marci for surgery around 12:30. Apparently the O.R. wasn’t ready at 11:30. So they got a little bit of a late start. We kissed and said our goodbyes for now. Even while being taken to surgery, Marci is still cheery, still laughing and telling me not to worry. But I’m about to burst into tears again. I can’t help but wonder if I’m saying a final goodbye to my dear wife. Dr. Hardy, the neuro-surgeon, came by the waiting room to let me know what they were going to do. He’s dressed in scrubs, coverings on his head and feet too. He looks ready to go. He said it he was still planning on six to eight hours, but it could be longer or shorter depending on what the tumor is made of. I’m listening for some encouragement, something that will make me feel better, but he’s pretty matter-of-fact about things. Not very emotional. But he does seem rested and anxious to get started, so that’s all the encouragement I need for now. The wait begins. We talk among ourselves, or sit in silence, or try to read and pass the time until the surgery is over. After a few hours I strolled down the hall and found the “meditation room” and tried praying alone in there. I was starting to feel anxious and just needed to pray. Too many people in the waiting room. When I returned, around 6 p.m., the nurse from the O.R. called us to tell us that about one third of the tumor was out. Things were going good, she said. That was an answer to prayer and made me feel a lot better. Around 8 p.m., Amber and Carrie spotted our surgeon in the cafeteria, apparently taking a snack break, and they asked him how things were going. He said fine. When I heard this, I thought maybe this meant the tumor was out and perhaps another surgeon was now closing. Maybe they were almost finished. But the wait continued and we got another call around 9:30 from the O.R. The nurse said that the tumor was finally out and they were ready to close. Things had gone well, she said, and they’d have Marci out in another couple of hours. I asked her about the tumor – if she had any information on it – and she said that the doctor would talk to us about that later. While it was good to hear that the surgery went well, I was worried about what the doctor might have to say. He also said that the next few days will be critical. They will monitor her closely in the CCU (Critical Care Unit). There are still things to worry about … swelling in the brain … seizures … other complications. So we’re not out of the woods yet. She’ll be there for several days. Still, we have every reason to thank God for where we are right now. If this is like a football game, we are in the first quarter and have a big lead. We’re winning! I think I saw a little smile on the surgeon’s face while he was giving us the news, and that was also very encouraging to me. Everybody went on home … Nate went back up to Orange County to be with his family … I stayed at the hospital a little longer because I wanted to see Marci before I went home. They let me in around 12:30 a.m. She looked really bad. Tubes sticking out of her everywhere. Even though I expected this, it was still a shock. When I got home around 1:30 a.m., there were lots of messages on the answering machine. Lots of e-mails. When I get up in the morning, I’ll try to send an e-mail message to let everybody know that the news is good so far. I really appreciate everybody’s concern. After sending an e-mail to everyone I could think of, I headed for the hospital around 9:00. They wouldn’t let me in the CCU when I got there, so I had to wait a while until they allowed visitors in at 11:00. When I saw Marci, she still had all those tubes in her, including the respirator going down her throat, so she couldn’t talk, but when she heard my voice, her eyes opened and I saw a little smile under all those tubes. My heart leapt. When I held her hand, she squeezed mine hard. The nurse told me not to get her too excited because they were testing to make sure she could breathe on her own. They wanted to take the respirator out soon. So I just stood and watched for a while, feeling really good that she recognized me and was trying to communicate. I left the room while they finished up their testing on her. I stayed with her for a good part of the afternoon, just looking at her while she slept, thinking to myself that even though her eyes are almost swollen shut, her face is all puffy, her hair is gone, she’s wrapped in bandages and has tubes galore coming out of her … she looks so beautiful to me. I don’t want to get too sentimental here, but I think I’m falling in love with my wife all over again. I’m just so happy that she’s doing well and that I’ll get her back. Corey also got a chance to see her in the CCU, but Amber was not feeling well and running a slight fever, so she couldn’t go in. Amber went on home today. I have really appreciated having her here during this time. I went home later in the afternoon, and we (Dixie, Corey and me) went out and got a little Chinese food. After being home a while, I wanted to go back down to the hospital and see Marci again. 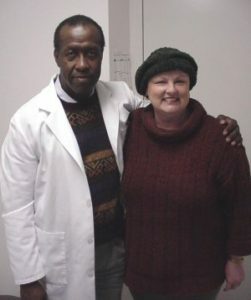 While I was there, Dr. Hardy came by to check up on her and he said she’s doing good. He checked her vision by holding up fingers and making her count. She got all the answers right, so he was pleased with that. He told her that her eyes would probably continue to swell until she couldn’t open them at all, and they would turn black. He said, “Remember what I told you … in another couple of days, you’ll look like you’ve been in a prize fight.” She laughed again. I told him that he was my new hero. What an amazing thing to be able to do … to go in and take a tumor out of somebody’s head, sew it back up, and have the person laughing the next day. Incredible. I got up this morning a created this web page. I had been journaling a little bit in the waiting room anyway, so I thought I would publish it here and let people who care about Marci read it. I’m really amazed by how many people have been leaving messages, sending e-mails, and doing other things to express their concern and love. There have been times in recent weeks when I’ve felt pretty lonely, but in reality I’ve never been alone. We have so many friends who were there all the time. I really hope that when Marci comes home and gets well we can stay in better touch with all our friends and family. I went to the hospital around 11:00 and went in to see Marci. Dixie had already arrived and was with her when I got there. Marci was awake and still doing fine. Her eyes were a little more swollen. Actually her whole face is pretty swollen. Since she didn’t have a mirror, I told her to imagine Humpty Dumpty, Winston Churchill, etc. Dixie said she had Bill Clinton eyes. We had a good laugh. After about thirty minutes or so, Dixie left to drive on back up to Paso Robles. Marci really appreciated having her sister here. I stayed with Marci for a while and she said she wanted to take a nap, so I went to the waiting room. Around noon, my brother Joe and his wife Debbie (from Camarillo) arrived. After letting Marci nap for a little while, I arranged for them to go in to see her. When they came out, they were totally blown away, saying they just couldn’t believe how great she was doing. Debbie (who had come down and spent some time with Marci a couple of weekends recently when I was away) said that Marci was more animated and upbeat than she could remember. “It really is a miracle,” she said. “Christmas has come early,” Joe commented. “What a great Christmas present this is!” Yes, I thought, this really is a miracle. Even some of the nurses in the intensive care unit have told me that they are surprised by how well she’s doing after all she’s gone through–such a large tumor and such a long and risky surgery. Corey and I then went in to see her and they were prepping her to take her for a CT Scan of her brain. They hook her up to the portable (battery-powered) instruments and wheel her off down the hall. Last night Dr. Hardy mentioned that he wanted to get a new CT Scan and see how her brain is doing. After she returned, we visited with her again until around 4 p.m. She was getting a bit tired, so we left. Corey went on home and I went out to dinner with Joe and Debbie before they left for Camarillo. I went back to the hospital and waited until 8:30 when visiting hours resumed. I stayed a while talking with her, feeding her some pudding (she is actually hungry) and holding her hand. As I look at her, I’m amazed she doesn’t feel more pain, but she doesn’t. Earlier in the day, one of the surgeons who was part of her surgical team came by (I didn’t get his name) and said that the reason her eyes were so swollen was because they removed her skull (in the forehead area) right down to the eyes. Then they put it back in and stapled her up. I find this hard to imagine. He also said that Marci was doing great. Speaking of dying people … I’m thinking what a wonderful ministry someone could have in that intensive care waiting room. I have been watching and listening to a parade of distraught families who have been grieving over loved ones who are suffering and dying … trying to make decisions about whether to continue life support or not … or to donate organs … I don’t see many clergy around, or anyone else who is there as a resource for them. I’ve been fortunate to have such a strong support system through all this. I did a little office work this morning and then headed for the hospital. When I saw Marci I noticed right away that some of the swelling around her eyes had gone down. She could open her eyes more and she was looking a little better. Seeing better, too. And she was in good spirits. The nurse and some of the other staff in the intensive care unit commented to me that Marci was really fun to be around — unlike some of their other patients. Doesn’t surprise me one bit. Marci also seemed a bit more talkative today if that’s possible. Around noon, my brother-in-law Gary Hopkins (Mary’s husband) came in with daughter Trisha for a visit. That was really nice of him to come all the way from Glendale. He was really happy to see for himself how well Marci is doing. Everyone says it’s hard to believe that she had a ten-hour brain surgery on Monday. Marci keeps talking about wanting to get up and walk around. I told her to just lay down and behave herself. She’ll be up soon enough. She can’t go anywhere with those tubes still implanted in her head. Marci also started eating real food today — no more liquid stuff. Her appetite is back. Nate came in for a short visit this afternoon also, as did Corey. Nate and his family live in the Mission Viejo area (Rancho Santa Margarita) and Corey is now living in Dallas. He came out early for his Christmas visit when he got the news about his mom. It’s good to have him home. They moved Marci from the CCU to the SICU (the Surgical Intensive Care Unit) down the hall which is a little quieter. Not so many trauma patients. Pastor Ray Benton from church stopped by to read a Psalm and pray. I stayed most of the afternoon with her. Dr. Hardy was supposed to come by around 5:00 for a visit and Marci was looking forward to that. She said she wanted to thank him for saving her life. She had tears in her eyes and a look of earnestness when she said that which really made me happy. The reason it made me happy is that those are the first tears I’ve seen in her eyes for a long, long time. In retrospect, I believe that the tumor (which was located in the frontal lobe where the personality is controlled) had robbed Marci of her emotions. But her tears today are an indication that maybe her emotional edges are coming back. I sure hope so. While she has not been unpleasant, even cheery most of the time (I thank God for that) she lost interest in the things that she was once passionate about and also seemed unfazed by the things that most people would want to cry over or get upset about. I’m so excited that Marci may be returning to her old self again. Dr. Hardy arrived right on schedule around 5:00 and Marci did indeed share her gratitude with him. He’s such a nice man and he humbly accepted her thanks. He also checked her over and said that everything’s looking real good. There’s a chance they may take the tube monitoring the pressure in her brain out tomorrow. He also said that she may be able to go home in a few days. He said “we’re in no hurry” but Marci got real excited about the possibility of going home soon — before Christmas. We hadn’t really considered that a possibility. Looks like I’ll need to get those Christmas decorations out after all and put up a tree! I haven’t had time to do anything yet. We still have Halloween pumpkins on the front porch. When I got home tonight, I got a real surprise to find that our good friend Ed Hume (a professional landscaper) had secretly “flowered” our house during the day. We have a large flower bed in front of our house which was rather barren … until tonight. 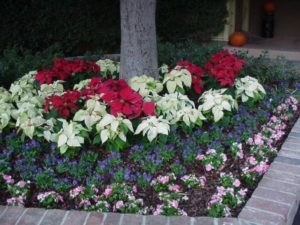 Now it has rows of beautiful flowers and dozens of incredible Poinsettias planted all over it. It looks terrific — Christmas has come to our house! I’m blown away by Eddie’s generosity and kindness. I can’t wait to tell Marci about it. This has been another great day! When I arrived at the hospital this morning, I noticed that the tube coming out of her head which monitored her brain pressure was gone. The doctor had said the day before that they may be able to take it out today, so I thought that perhaps he had come in and removed it before I got there. I was wrong. I discovered that Marci had become agitated and restless during the night and yanked it out of her head herself. Needless to say, this was not good. Marci doesn’t remember doing it at all, but they said that she actually fought the nurse for it. The nurse lost, I guess. The nurse also told me that she was very restless all day long, wanting to get out of the bed, not able to lie still, and so forth. I could also tell that she was restless–not very comfortable and trying to sit up, roll over, etc. As I talked with her, I noticed also that she was saying some things that didn’t quite “compute,” which confirmed that she was a bit disoriented and confused. The nurse tried to get Dr. Hardy on the phone to find out what to do, but Dr. Hardy was in another surgery today at Grossmont Hospital and couldn’t get free right away. When he did come to the phone, he told them to get another CT scan of Marci’s brain so that they could see how her brain pressure is doing. My understanding is that pressure on the brain is the most important concern and now the only way to check it is to take CT scans. So they took her down the hall to get that done. Corey and I went to the cafeteria for lunch while they did that. The scan apparently revealed that no damage was done by Marci’s removal of the tube. The nurse joked that we probably saved the insurance company $500 by taking it out ourselves instead of having the doctor do it. I didn’t laugh at that comment. I’m worried today about her and hurting inside because she is appears to be going through a difficult part of her recovery. I’m hoping that this isn’t a serious setback, but just a temporary one, a minor bump in the road towards her getting well. I can understand her disorientation, her confusion. She saying a few stupid things, but I know that I have said some pretty stupid things when I’ve been on medication, or in bed for several days and you lose track of time and place. The nurse looked at her charts and decided that some medication that Marci was given by the previous nurse the night before may have caused a bad reaction which led to her behavior today. I can’t remember the name of it, but it was supposed to help her sleep and apparently it made her become agitated. They made a note to not give her any of that medication again. They are also planning to insert something to drain fluid off her brain through her spinal cord (a “lumbar drain” or something like that) which apparently will help relieve the pressure in her brain as it expands to fill the cavity left behind by the tumor. Currently it is being drained from another tube (still in, thank God) coming out of her head. I don’t think they want to risk it being yanked out like the other one was. They are also considering sedating her a little bit to ease her restlessness. I spent the day with her, most of the time standing right next to the bed trying to keep her calm. Overall, she’s still pretty lucid and in good spirits. She continues to smile a lot and she laughs whenever I say something even slightly humorous. We talked a lot and prayed together several times. While praying, she is not disoriented at all. Her prayers touched my heart. Today would have to be called a setback day compared to the first three after surgery, but I’m not too worried. She’s very uncomfortable right now and I guess that is to be expected. The doctor had said to expect that, and not to be surprised when it seemed she was getting worse, not better, on some days. We’re still praying and trusting in God to continue to return Marci to us. I’ve been getting some very uplifting e-mails and messages from friends and family. Everyone is so thoughtful and encouraging. I arrived at the hospital around 10:30 a.m. and asked the ICU nurse if I could come in early. She came to the door and told me that Marci had a good night, that the doctor had come in and checked her, and that he decided not to drain fluid from her spinal cord after all. She was doing fine and resting well. 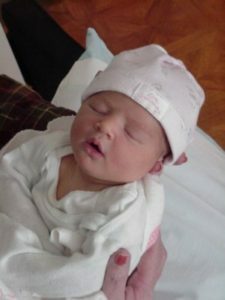 In fact, she was sleeping now and the nurse thought it would be best not to disturb her for a while longer. So I went to the waiting room for a while, feeling pretty happy that Marci was better than yesterday and anxious to see her. When I entered her room about an hour later, she was smiling and looking much better. More of the swelling in her face had gone down and she could open her eyes a little more. The color in her face looked better, too. And she definitely seemed less agitated, more serene. The nurse said that the doctor ordered physical and occupational therapy for her, so she would be able to get up out of bed today. That made Marci a happy camper. She was really getting tired of lying down all the time. I brought in a stack of get-well cards for Marci to see and I also printed out most of the e-mails that had come in from friends and family with well-wishes and other messages for her. I asked her to try reading one of them herself and she did, although slowly. She has had some problems with her vision. Her eyes are still swollen, and one eye seems a little cross-eyed as a result. She can see pretty well considering that the surgeon told us he had to peel the tumor off of her optic nerve. That’s hard to imagine. The occupational therapist came in and said that her job was to help Marci gain back some basic living skills — brushing her teeth, getting in and out of bed, etc. For her first session, she sat up, got out of bed and was helped into a chair. It felt great to see her out of that bed. She did fine. While she sat in the chair (still hooked up to most of the cables and tubes) she ate her lunch. When she was finished, I read some of the e-mails and cards to her. She loved hearing them, but grew tired quickly and wanted to lie back down. The therapist and nurse got her back into bed and she napped while I went down to the cafeteria to get some lunch of my own. When I returned, the physical therapist was there, helping her move her arms and legs, and he also got her out of bed so that she could try walking a few steps. She didn’t go very far, but it was a good start. Watching this, I’m praising God inside for what he’s done in Marci’s life. It’s hard to believe that she’s upright and walking only five days after a ten-hour brain surgery. I’m also feeling very grateful that today was not like yesterday. She’s doing great today and seems much improved but there are times when she seems disoriented. She is especially confused by what time of day it is. The clock on the wall doesn’t make sense to her. She sleeps in short segments (minutes), but she is sure that she has been asleep for hours which makes her think it’s the next day. I’m sure that will be resolved when she comes home and gets back to a regular sleeping pattern. The rest of the afternoon, Marci rested while I watched the Chargers-Raiders game on the TV in her room. We have Chargers season tickets, but I gave ours away for today’s game. As it turned out, it was another Chargers loss. I’m glad I got to be with my wife instead, because I got to see a Marci win. Some of our friends have called or written asking when they will be able to visit her. As long as she’s in intensive care, only family members and clergy are encouraged to visit. But as soon as I know when she’ll be transferred to a regular hospital bed (or released to come home) and can have more visitors, I’ll let everybody know here. Marci was in good spirits, sitting in a chair when I arrived this morning. The doctor had been there early this morning and removed the drain tube from her head. When he removed the tumor during surgery, he filled the empty space with water. As as the brain expanded to fill up the space, the water (we jokingly called it “brain juice”) came out through the tube into a little flask. By yesterday, the flow had pretty much stopped, indicating that the brain was no longer swelling. So, the tube was taken out. Marci laughed and said she found out that she also got a “tummy tuck” as a bonus during surgery. I thought she was saying something stupid again but she showed me a spot on her tummy where the doctor actually had taken a little patch of skin from her tummy and transplanted it into her forehead to fill in an empty place. While the doctor visited today, he added a couple of new staples in her head. Marci said it really didn’t hurt at all, but it felt funny. Thump-thump-thump. I didn’t see the spot where the staples were added because he bandaged it all up again, a little tighter this time to reduce some swelling in her forehead. But overall, she looks good and she feels better without having any hardware attached to her skull. I am amazed by all of this. I also learned that the doctor said she’d be in intensive care one more night. Tomorrow she should be transferred “upstairs” to a regular hospital bed. The doctor will check on her tomorrow morning and if she’s still doing fine, he’ll write up the orders for the transfer. When she’s out of ICU, she’ll be able to have visitors and get more physical therapy in preparation for her discharge. We still don’t know when that will be. Marci did have some visitors today, however. Amber came for a visit, as did my good buddy Ken Elben (junior high pastor at Shadow Mountain Community Church) and his wife Joy. Ken and Joy were really amazed at how great Marci looked and how animated and conversational she is. Seems like everybody who sees her comes away saying “It’s a miracle! !” I have to agree. Before they left, Ken led us in a prayer of thanksgiving right there in the hospital corridor. Corey also came to the hospital this afternoon and brought his girlfriend Jana Beers, a senior at John Brown University who flew out from Arkansas last night. I doubt that this is how Corey originally envisioned his girlfriend would meet his parents–both of us with our heads bandaged up. But she handled the situation real well. She’s a lovely girl and we’ll enjoy getting to know her better in the days ahead. 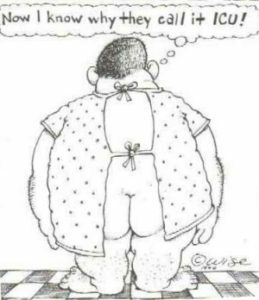 Marci’s cousin Joan sent us this cartoon by e-mail which was a big hit at the hospital. Today Marci graduated from the ICU on the first floor to a regular hospital bed on the fourth floor. Her room is 407A which she shares with another lady who is recuperating from a recent automobile accident. Marci had already made the move when I got there this morning and she was very happy to be out of intensive care. She’s especially glad that she no longer has cables and tubes connecting her to machines and monitors. She can move more freely, and the room is a lot quieter. She can make and receive phone calls and she can also have visitors (during visiting hours, which are from 10:30 a.m. to 8:30 p.m.). In fact, she had some visitors today. My brother Jim and his wife Daryl (from Camarillo) were the first to arrive. It was good to see them. They brought Marci a really nice handmade Christmas angel for the room. Our friend Chuck Workman brought her a bouquet of roses and she also received beautiful flower arrangements from Youth Specialties and Mike and Karla Yaconelli. Things are looking a whole lot better in here already! There are no flowers in the ICU. Also, Mike and Cami Cloud and their three kids (friends from church) came by for a visit. Marci enjoyed visiting with her guests today and she seems to be doing fine. She did report some dizziness, especially when she sat or stood upright. She got some physical therapy today and she really liked the handsome young man who helped her walked down the hall and back. He’s a real hunk, she said. I may have to chaperone her next physical therapy session. A group of Christmas carolers came down the hall singing carols and Marci really enjoyed listening to them. So did I. It reminded me of all the times Marci and I have been carolers in hospitals, convalescent homes and such. It’s really nice to be on the receiving end of that now. Marci said that when she left the intensive care unit, several of the nurses came to tell her goodbye, saying that they really enjoyed having her there. I have really been impressed with the nursing staff at Scripps. They are very kind and they are very good at what they do. Marci and I talked alone for a while this afternoon, just marveling that it was only a week ago that she was wheeled into that operating room. Marci said she wasn’t afraid at all, but I was dying inside. Today I feel so different. I’m reminded of that verse “the people living in darkness have seen a great light.” (Matthew 4:16). A week ago I was engulfed in darkness but today I’m dazzled by the light of God’s grace and mercy on us. To Him be the glory! Marci showed more improvement today. She say’s she not feeling as dizzy as yesterday, and she’s walking with a little more steadiness. I’ve been “dancing” with her from the bed to the bathroom and I noticed that she doesn’t need my help quite as much as yesterday. We don’t want her to fall, however, so when I’m there we’ll keep dancing or someone else will help her get around. We also got delivery on one of those aluminum “front wheel walkers” today. She may need to use that thing for a while. But she’s really doing good. Dr. Hardy came by while I was there today. He indicated that she might be able to go home very soon. He said he’d check back with her tomorrow and see how she was doing. She needs more occupational and physical therapy (which she gets daily) but she’s doing great, he said. We had a few questions for him, and Marci asked him one that made him laugh. “What color was the tumor?” He answered by saying that it was grey … just like her brain. Hmmm. Made me wonder how he knew where a tumor ends and the brain begins. I guess that’s why they get paid the big bucks. After Dr. Hardy left the room, we still weren’t sure how long she’d remain in the hospital. I’m guessing maybe the end of the week but I really don’t know. Hopefully she’ll still be home for Christmas. Meanwhile, she’s comfortable and doing her best to get better. She’s being patient and trying to relax. She enjoyed visits from friends today, including Cay and Allan Hough. I didn’t stay the whole day. I left for a couple of hours in the afternoon to see if I could do a little Christmas shopping. Better late than never, I guess. I returned around 5 p.m. and she was eating dinner and visiting with her friend Carol Johnston who dropped by. I left for home around 7:30. On the way out I’m wondering how much money I’ve spent so far in parking fees at the hospital. Actually, I don’t really care. Marci said it was okay to let people know the phone number of her room. (removed) … Hopefully she won’t be flooded with more phone calls than she can handle, but it’s definitely okay to call. She likes to talk. Marci is anxious to go home. She’s feeling better and getting stronger each day. By the time I arrived at the hospital this morning, she had already had a couple of physical therapy sessions, walking laps around the hospital corridor. One of the nurses said she thinks Marci may be able to go home tomorrow, but that’s not confirmed with the doctor. I know he doesn’t want to rush things. Neither do I. But I’d like Marci home for Christmas. After she ate some lunch, I took her in a wheelchair outside the hospital. There’s a small but nice park in front of the hospital with trees that are turning color and a fountain that’s not working right now. But today was a beautiful sunny day in San Diego, so Marci really enjoyed getting some fresh air–the first she’s had in ten days. She wore a robe I brought from home and a little hat that one of the nurses gave her. With her sunglasses, she looked pretty stylish out there. Rev. Walt Barnes from church came to visit just as we were leaving the room, so he joined us for our stroll through the park and took time to read some Scripture and pray with us. We have appreciated the pastoral care we’ve received from our church during this time. A few minutes after we returned to the hospital room, we were surprised by some visitors–Frank and Pam Rivera, Karen Kuhl, and Tic and Terrie Long. They stayed for a good while and we had some laughs with these old friends. It’s so good to be laughing again. Marci even took the bandages off her bald head to show off her scar and staples. Apparently she’s not only getting better, she’s getting bolder. I lifted my hat and showed them the bandage on my head but I didn’t take it off. I’m sure they appreciated that. I left the hospital earlier than normal tonight (around 5:30) so that I could go shopping for a Christmas tree. I found a nice one in Santee. I think they’ve lowered the prices because it wasn’t too expensive (compared with last year). When I got home, I discovered that Corey and Jana had decorated the inside of the house with some Christmas decorations in anticipation of Marci’s coming home soon. Maybe tomorrow I’ll be able to put some lights on the house and get the pumpkins off the front porch. I still don’t know exactly when Marci will be discharged. We gave a list of questions to Marci’s supervising nurse which will be passed along to the doctor today or tomorrow. Besides knowing when she’ll get to go home, we also want to know what we need to do at home to continue her recovery, when the staples will come out of her head, what medications she’ll need to stay on and so forth. We realized that we just don’t know much about what to expect during the next few weeks and months. Hopefully we’ll get some answers soon and can make plans. This is all so new to us. Each day I bring in a stack of e-mails and cards that have been sent from friends and family and read them to Marci. She still has trouble with her vision, so she can’t read without getting dizzy. I brought her reading glasses in to see if they helped and they didn’t. In fact, she wondered if they were actually her glasses. She said the prescription seemed wrong. But I assured her that they were definitely her glasses. Whether this change in her vision is temporary or permanent, we really don’t know. The doctor indicated that we’ll just have to wait and see. But right now, that’s about the only change I see in Marci as a result of this whole ordeal. For this I am very thankful. The doctor had warned us that there could be some dramatic personality changes in Marci since the tumor was located in the frontal lobe where the personality is controlled. But so far, she really does seem like her old self. This is God’s Christmas gift to all of us this year–we get Marci back! Excuse me if today’s report is a bit shorter than usual … but MARCI CAME HOME FROM THE HOSPITAL TONIGHT!! It’s about 9:30 p.m. as I type these words and we got home about an hour ago. But I wanted everyone to know. She’s doing great and she’s really glad to be home. And she’s anxious to hear from anyone who would like to give her a call. 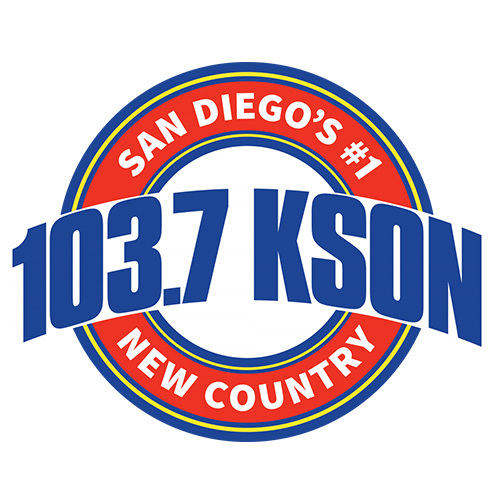 Our phone number is (619) 561-4395 in case you don’t have it. To summarize today’s events … She got up … had breakfast … asked the nurse if she could go home … did some physical therapy … asked the physical therapist if she could go home … had lunch … went for a wheelchair ride outside the hospital with me … asked me (several times) if she could go home … well, you get the idea. Finally the doctor came in around 6 p.m. and asked her, “Do you want to go home?” to which she replied, “Not only do I want to go home, I want a cheeseburger.” The doctor asked, “Do you want to go home right now?” She said “Yes!” I said, “Um … what about those staples in her head?” He said, “I’ll have a nurse take them out right now. Everything’s looking fine. You can go home.” He gave us some other instructions about medication, follow up visits, a home health nurse who will be coming by every day for a while to check up on her. The nurse took out the staples (Marci said it didn’t hurt at all), all 51 of them, including one that the doctor said was a mistake. It was in the back of her neck and used to hold the drape over her head in the operating room. Hmmm. Dr. Hardy examined the incision on Marci’s head one more time and gave us further instructions. While he’s talking, I’m just in awe of this man. I’m so thankful for what he has done for my wife. I’m reminded of the words we saw hanging on his office wall: “My life is evidence of my victories.” Marci is another of his victories. God has used him to bless our lives and I will always be grateful. This morning I bought Marci a Santa hat to wear over her bandage and she wore it home tonight. She looks radiant. On the way home, we stopped for a cheeseburger. So here we are at home. Unbelievable. I want to thank everyone who has supported us through this time. The outpouring of love that we’ve received from friends has been overwhelming. We will be in touch with you again and I’ll try to post updates and notes here from time to time to let you know how Marci is doing. I am rejoicing tonight. To God be the glory! Since Marci came home from the hospital last Thursday night, she has been amazing. For the past year and a half, she has not slept very well at night, so she often slept during the day–sometimes not getting up until well into the afternoon. Then she would just sit, eat and watch TV the rest of the day. But she is now sleeping well at night. She has developed a pretty good snore (I think from the puffiness in her face cased by the steroids) but I love listening to it. She wakes me with her snore and I’m just happy that she’s sleeping so well. What a blessing! And, she gets up in the morning refreshed and ready to go! She has also recovered her sense of smell and many other physical losses of the past year or so. She no longer is having the intestinal problems that were so embarrassing for her nor the aches and pains all over her body that made it hard for her to do any kind of physical activity. Most importantly, she seems to have regained her desire to do things. It was so disheartening for me to watch her sit and waste away the hours doing nothing at all. 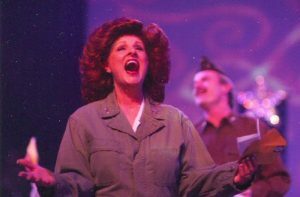 It’s so good to hear her talking about re-joining the Shadow Mountain Community Church choir which she dropped out of more than a year ago and other things she wants to do now. We had visits before Christmas from many good friends who stopped by the house to see for their own eyes the miracle that God did in Marci’s life. Many came bearing gifts! We really have felt cared for in a special way through all of this. 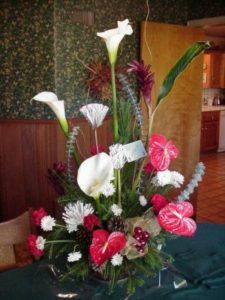 Our friend Jim Popp brought Marci several things including a singing snowman stuffed toy which shivers in the cold and a HUGE flower arrangement. We had a wonderful Christmas celebration with our family. Nathan came on Sunday night, Amber (with her foster son Sean and her boyfriend Tommy and his two daughters) on Christmas day. Corey and his girlfriend Janna were with us the whole time. On Christmas Eve, we went to Shadow Mountain church for the Christmas Eve candlelight service. Lots of people were surprised to see Marci there, including our senior pastor, Dr. David Jeremiah. She drew quite a crowd and everyone was praising God for this miracle. It was hard to believe that two weeks ago to the day Marci was on the operating table. Tonight, she is full of life and laughter, thanking everyone for their prayers. We all got some nice gifts for Christmas (I really liked my new bottle of after-shave lotion!) In addition to her other gifts, I put a note in Marci’s stocking saying that I’d buy her the new VW bug that she’s wanted for years. She was real excited about that! We’ll go car shopping real soon. She looks kinda cute in that goofy Santa hat she’s been wearing. 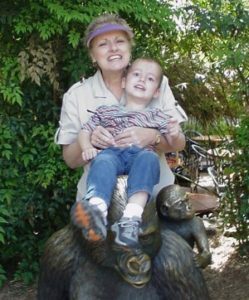 When our grandson Nicholas saw her without the hat (and her bald head and scar showing), he said “Gamma, put your hat on!” Marci is still on steroids (to reduce the possibility of swelling in the brain) and they make her face a little puffy. We have so much to be thankful for this Christmas. We are well aware that not all people are so blessed, which makes it all the more incredible that God would smile on us in this way. Dr. Jeremiah told Marci and me on Christmas Eve that when he was in the hospital with cancer, he could literally FEEL the prayers of God’s people being offered up on his behalf. We can now understand what he means. When Marci went into surgery, she had no fear. When I was feeling so incapable of praying effectively, I had confidence that others were lifting us up in prayer. I couldn’t explain it, but I could feel it. Prayer is how God allows us to participate in his healing restorative work, and we are privileged to do so. I know that from now on, whenever I have a chance to pray for someone else, I will do it with a new sense of significance, passion and intensity. But perhaps my greatest lesson learned through all this is I have experienced firsthand that God does indeed turn our “wailing into dancing” (Psalm 30:11). As I wrote earlier, I wouldn’t wish what we just went through on anyone. But I have to say that I am glad we went through it–just to receive the blessings that God is still pouring out on us. I have recited that verse in Romans many times “For all things work together for good to them who love God and are called according to his purpose” (8:28), but now I have a deeper understanding of what that verse means. God doesn’t always spare us from the bad things that happen to us, but he always turns it upside down so that the last laugh is ours. We are laughing now. Our family has been touched deeply by all this, as has many of our friends. And I can say that I am totally in awe of my wife and more in love with her today than I can remember. Isn’t that worth going through a tough year and a half for? Marci commented the other night that God had not only given her new life, but new responsibility. There’s most certainly a reason why God wants her to be whole again. He has something for her to do. With that tumor out of her head, she can now be about the business of serving God and touching people’s lives as only she can. The year 2001 was a difficult year, not only for Marci but for the whole world. I’m excited about what the new year will bring–not only for Marci but for all of us. Marci went to Dr. Hardy’s office for a check up. Everything’s looking good, he said. He consented to pose for a picture with the new president of his fan club. Here’s a picture of Marci five months after her surgery. She has been feeling great and has been on a fitness program of diet and exercise to help her keep up with her grandchildren. Here she is with Nick at the San Diego Wild Animal Park. MAY 2002 — An update. Marci has really been doing good since her surgery almost six months ago … singing in the choir, doing “Creative Memories” scrapbooking, fixing up the house (we’re redecorating several rooms), learning new computer programs, enjoying the grandchildren, taking good care of her husband … She’s very busy — quite a change from last year. In fact, I’m having a hard time keeping up with her. She is amazing and definitely the best thing in my life right now. God has been so good to us. So far, all of her checkups with the doctor have been positive and she continues to get stronger and healthier. We’re also grateful that we had good health insurance. The hospital and doctor bills were high as you can imagine, but I felt kind of guilty when I received our final bill from our neurosurgeon, Dr. Hardy. It was for a grand total of $20.65. Our son Nathan suggested that we offer him a tip. We didn’t get off that easy with some of the other bills, but I don’t think I’ll grumble quite so much any more when paying our health insurance premiums. We are looking forward to a good summer together. We have a trip to Ireland planned for August, and we’ll also be doing some traveling together in the fall. 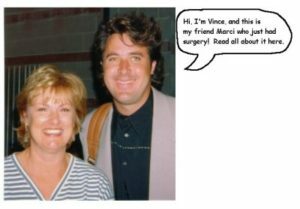 Marci will be able to share her story with people at both the International Bluegrass Music Association trade show in Louisville and Bill and Gloria Gather’s “Praise Gathering” in Indianapolis. She got to give her testimony on a local TV show in April and she’s anxious to do that some more. She has been a blessing to a lot of people. I’ve been busy this spring conducting seminars and writing a new book for teenagers called “Read This Book or You’re Grounded.” It’s about how to get along with your parents, and will be published in January of next year. I’m looking forward to a more relaxed summer with a lot of fishing and spending time with my wife. Marci continues to be healthy and very active. She has had several checkups and MRI’s, and all have been good. Dr. Hardy says he probably doesn’t need to see her anymore. She’s doing fine and there’s zero chance of the tumor causing her any more problems. So we are grateful for that. 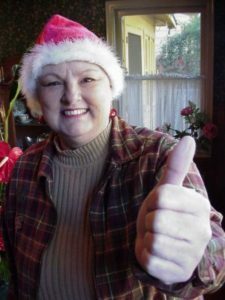 One neat thing is that Marci has had a chance to offer encouragement to other people who have been diagnosed with brain tumors. Even though they are all different, I can remember how encouraging it was to hear about someone who had a tumor and survived it. Marci is doing fine … she’s busier than ever, especially now that she has a job at a really neat Tea House in La Mesa called The AubreyRose. She waits tables and uses her outgoing personality to good advantage, making a lot of customers happy. This is a part time job (just 2 or 3 days a week), but it’s been good for Marci. We are still amazed at how good God has been to us and very grateful. We were with our grandchildren on Christmas Day and when we look at three-year Maddie, we are reminded of how blessed we are. Marci is still doing great. She has a new job as assistant to the Pastor of Small Groups at Shadow Mountain Community Church. She only works three days a week so she still has time for her grandkids and other interests. Her health is excellent and she’s active as ever. We went to Hawaii in December to celebrate our 40th wedding anniversary, which is actually in January. (I’m a college professor now, so I have to take time for trips like that when I can!) We had a great time. It’s hard to believe that nine years passed since the last time I updated this page on my website. A lot has happened during this time, including Marci’s diagnosis of MS which has changed her life and mine, too. I posted an article on my blog which pretty much tells the story. So far as we know, Marci’s brain tumor had nothing to do with her current health situation. While recent MRI’s of her brain do indicate that remnants of the meningioma still exist, there’s no evidence that the tumor has led to her getting multiple sclerosis. Here are a list of the symptoms Marci experienced during the year and a half before she was diagnosed with a brain tumor. They were all being treated by various doctors during that time. Not one of them suggested that a brain tumor might be the cause. 1. Sleep disturbance. Our doctor prescribed various kinds of sleeping pills. She had trouble sleeping at night and would often sleep during the day. I tried getting her up our of bed in the morning, but usually was not very successful at this. Since her surgery, she has returned to a normal sleeping pattern. 2. Loss of energy and personality changes. She had neither the energy nor the desire to do the things she normally did, like sing in the church choir or participate in other church activities (she was a deaconess, active in women’s ministries, etc.) She seemed emotionally flat–no real passion for the things she normally cared deeply about. She had no emotional depth–no anger or sadness or excitement or joy. She also stopped working for me in my ministry (she ran the office of Understanding Your Teenager). I had to hire someone else to replace her. She stopped doing household duties (I eventually hired a housekeeper and learned how to cook!) When she was awake, she just sat in her chair and watched TV (which was not like her at all.) As you can imagine, this was hard for me to deal with. I experienced emotions that ranging from anxiety and sorrow to frustration and anger. I told her more than once that I “wanted my wife back” but she seemed unable or unwilling to change. I must confess that I allowed this condition to go on way too long. Since her surgery, she has returned to her old self. She’s busy around the house and making plans to do all sorts of things. This has been truly remarkable to see such a dramatic change. She remembers asking one of her friends a few months ago to pray that she would “get her joy back.” Well, it’s back! 3. Incontinence. This was very embarrassing for her. She had little control over her bladder or bowel movements. When she had to go, she often went without warning, wherever she happened to be. She had embarrassing accidents away from home on several occasions, and often was unable to make it to the bathroom in time when she was at home. Our doctor referred her to a specialist, a gastroenterologist, who prescribed various kinds of medications to help control her “colon spasms” and such, but nothing seemed to work. I eventually made her wear Depends (an adult diaper) at all times. This was difficult for me and must have been humiliating for her, although she seemed to handle it okay. When we discovered her brain tumor, we asked Dr. Hardy about her incontinence–if there was any relationship between it and the tumor. He explained that the brain (particularly the frontal lobe) does control “appropriate and inappropriate behaviors” as he put it, and that includes bladder and bowel movements. When you have to go, a signal is sent to the brain and the brain decides whether to go now or later and the body responds to that. She has had no problems with this at all since the tumor was removed. 4. Loss of her sense of smell. This was probably the first thing to go several years ago. When Marci told our family doctor about this, he dismissed it as a common malady of growing older. Dr. Hardy said that it could have (perhaps should have) been the first clue that a tumor was interfering with her olfactory nerves. Her smell has returned which even Dr. Hardy has found surprising. 5. Pain in her arms and shoulders and other muscular soreness. Our doctor sent her to an orthopedic surgeon who did an MRI on her shoulders (found nothing … too bad they didn’t look a little higher!) He prescribed physical therapy, which she eventually did receive and it helped some. Most of that pain is now gone. She’s still regaining strength in her arms and legs. 6. Headaches and vomiting. Actually, she has had headaches for a long time, some of which were diagnosed as sinus headaches. But during the last two or three months before her surgery, she was having more severe headaches accompanied by vomiting which often happened without warning. She didn’t feel nauseous at all but she would vomit. This was very unusual for her and worrisome for me. It was what made me more determined to find out what was wrong with her. Those were the main symptoms. Considering the size of her tumor, it is surprising there weren’t more. Over the course of the last year or two, everyone seemed to have an idea, opinion or diagnosis of her condition. Because she had gall bladder surgery two years ago, many thought her condition must be the result of that surgery, or perhaps a bad reaction to the anesthetic. Others suggested chronic fatigue syndrome, lupus, menopause, a hormone imbalance (she was seeing an OBGYN for this and given doses of both estrogen and testerone), fiber myalgia, or a bad reaction to the diet drug fen-fen, drinking Diet Coke (with its artifical sweetener), living under high voltage power lines, and the list goes on. My friend Chuck Workman suggested that a good counselor might help — so I made an appointment for Marci with the counselor he recommended, Dr. Christine Osterloh. Maybe there was some underlying psychological problem that she could uncover. Dr. Osterloh did help, but in an unexpected way. She suggested that before they begin therapy, a complete physical exam might be in order, including an MRI of her brain “just to rule out anything physical … I don’t want to alarm you,” she said, “but you want to make sure there’s not a brain tumor or something like that.” I agreed with her about a physical, but I really didn’t know what to do at that point or where to go. She had been looked at by a lot of doctors, but no one had done a scan of her brain. I decided to look into the possibility of getting her in to see a neurologist, who is a specialist in brain disorders. It took me a while to schedule an appointment with one (some weren’t taking new patients), but I finally did. Our family doctor (with some pushing by me) ordered the MRI. The MRI was on Friday, November 30. I had to travel that day to Texas to speak on Saturday and Sunday, so our son Nathan took Marci to Grossmont Hospital to get the MRI done. The plan was for me to go to the hospital on Monday or Tuesday and pick up the MRI (the film) so that I could take it with us to our appointment with the neurologist on Tuesday. But when the MRI was done, the radiologist immediately spotted the tumor (which was obvious) and called our family doctor who in turn cancelled the appointment with the neurologist and scheduled an appointment with Dr. Hardy, our surgeon. I got the news that evening when I arrived in Texas and called home, making for a challenging weekend of speaking for me to say the least. I was very upset, as were our children and others close to Marci–but she was calm and had no fear. This was a blessing. For me, while the days leading up to Marci’s surgery were emotionally difficult, I grew more hopeful as I began to hear stories about other people who had brain tumors and survived. I can’t tell you how comforting and encouraging those reports were. That is one reason why I hope that Marci’s story here can be a blessing to others who may be facing the same challenge. There is definitely hope, especially to those who have faith and believe in the power of prayer!